Hello and welcome to November. This month I want to talk to you about self massage, focusing in particular on the lymphatic system. Ready to get rid of those ’Bingo wings’? I have a yoga class that I teach regularly that incorporates a few self massage techniques that help to get the fluids of the body moving. I would love to share three of these simple techniques with you this month. We tend to forget that we have two hands of our own that are completely free, there is no charge to self massage and it is OK to touch yourself! I always like to use analogies when explaining what we are trying to achieve during a particular yoga class. I like to think of the body as a river bed and the breath as the water. When you come across a river of water that is clean, fresh and free flowing, it looks inviting and everyone wants to dive in and have a swim. But when that river becomes dried up and there are only pools of water that are held there by rocks and sticks, the water becomes stagnant and stinky and no-one wants to dive into those murky waters. Our body is the same. When we go to sleep at night, our bodies are more still and the circulation slows down. When this happens there is a layer of ‘fuzz’ (the interfaces between the muscles) that grows between the skin and the muscles. When we wake and move, get up, get dressed, brush our teeth, make the bed and so on, the circulation increases and flushes or melts most of this “fuzz” away and the sliding of the muscles becomes more fluid. But just like the river there are pockets, joints and tight areas that stagnate and over time without massage or vigorous movement these pockets get built up and can become problem areas of fluid retention. Self massage is a great way to get these stagnant pockets moving and free flowing again. - Lymph vessels carry 75% of the waste rejected by our cells. - Blocked lymphatic can lead to water retention, cellulite, exhaustion, stretch marks and swollen ankles. - If lymphs begin to circulate poorly due to blockages, vital functions can become impaired. - Blockages can prevent the drainage of water and toxins. - When the body stores too much fat, the fatty cells become large and constrict blood and lymph vessels. - Regeneration of injured or wrinkled tissue. - Relief of sinusitis, bronchitis, ear infections, constipation, insomnia, cellulite and obesity. Let me share with you now three self massage techniques that help common areas in the body that hold fluid. 1. The feet are the foundation of the body and when they are swollen, stiff and uncomfortable the rest of the body suffers. • Sit on a chair or the floor and place your foot on your thigh or on a pillow with the sole of your foot facing upwards. • Use both your thumbs or opposite elbow to press into these particular areas on your foot. • Keep the downwards pressure going as you draw circles around the point. • The first point is under the pad of your big toe. • The second point is between the second and third toe under the pad where it slightly rises. 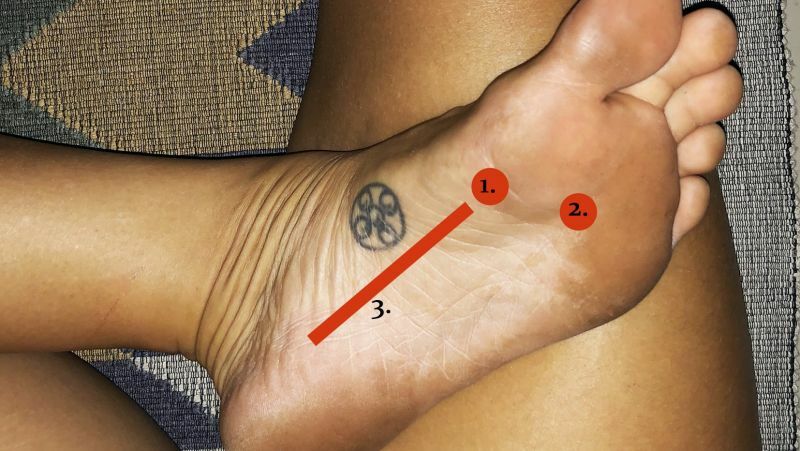 • The third is the arch of the foot (plantar fascia) – working from the top of the arch to the bottom of the arch above the heel and push from the inside of the arch to the outer edge in a line. 2. I call this technique ‘the bash’ and it is great for the area around the bottom, hamstring and outer thigh. • Sit on a chair or the floor and hold your ankle with your opposite hand, the knee is bent towards the chest. • Make a fist with your other hand, thumb next to the index finger, and hit your fist into the bottom, the hamstring and outer thigh. Much like hitting dust off a dirty hanging floor rug. 3. I call this technique the ‘bingo wing buster’ (upper arms) but this technique is also great for the legs, bottom and mid-section. 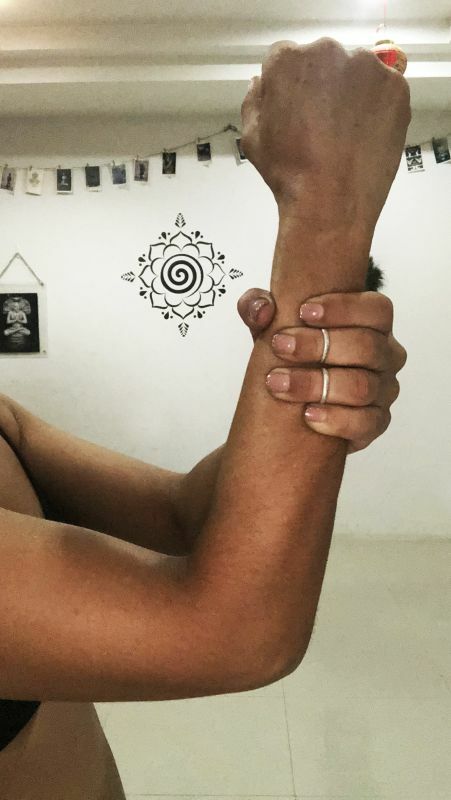 • Lift your forearm and grasp the forearm firmly with the opposite hand. • Squeeze the hands into the arm and twist the hand in one direction as the arm twists in the other direction. Much like a ‘Chinese burn or a charlie horse’. You will feel a warm, pinching sensation on the skin. • Walk this twisted squeeze up and down the entire arm. I also would like to mention that drinking plenty of water (two litres a day) is also a great way to help flush the toxins from the body and works very well when incorporated with these simple self massage techniques. Have a great month & happy stretching.